When I heard that Esoteric Recordings, those wonderful curators of Rock’s Rich Tapestry, were re-releasing the self-titled album by Leicester band Spring, an obscure bunch of very early prog rockers, conversely well known in the world of record collecting, my nostalgia gene went into reverie overload. This great album was one of a handful I bought as an eleven or twelve-year old from a bargain bin in our local supermarket. Priced at anywhere from 50 pence up to a barely affordable £1.50, this album along with the likes of Indian Summer, Clear Blue Sky, Gracious!, and others were bought purely on a whim, largely resting on how much I liked the cover art. Vertigo cover artist Keef, and the early work of Hipgnosis have a lot to answer for, as their enticing peacock displays formed the basis of my early vinyl collection and thereby opened up the door to an obscure universe in which I still willingly lose myself. This particular album was originally released on the short-lived Neon label, which was RCA’s answer to Philips’ underground imprint Vertigo, and indeed set up by the same man, one Olav Wyper. Unlike the much longer lasting Vertigo “spiral”, Neon only survived for eight releases, original pressings of which are highly sought after today. When, with great reluctance due to redundancy and a short period of unemployment, I sadly had to part with my copy of the lavishly packaged Spring album with its beautiful tri-fold out Keef designed cover, it fetched the princely sum of £250, if memory serves. That was in 1992, and nowadays do not expect to pick up a copy of the original in anything at or over VG+ for less than £750. I eventually managed to get hold of a cheaper replacement in poor condition, but I still miss my pristine version of that gorgeous package. Sigh…I suppose none of that matters really, what makes this charming slice of early prog rock still worth a listen today is the quality of the songs, the majority of which are soaked in Mellotron, making Spring a must for anyone interested in the history of our chosen genre. Evolving from a band formed in 1965 by the name of Sleepy John’s Opus, which contained drummer Pat Moran and bassist Adrian “Bone” Maloney, in July 1969 Spring found themselves stranded in the Welsh town of Monmouth, their van having run out of fuel. While wandering about looking for a garage they came across local resident Kingsley Ward, co-owner with his brother Charles of Rockfield recording studios. Kingsley Ward became their manager, and early the following year he persuaded then up and coming producer Gus Dudgeon to come down to Rockfield to meet his charges and to see if he would be interested in producing the band. He was, and the result is this fine album, here twinned with the first official release of tracks intended for a never made second album. 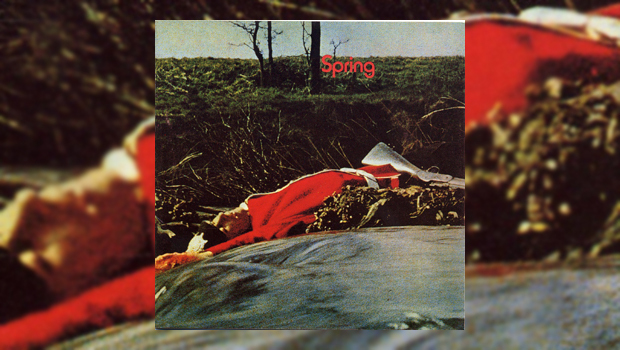 The other members of Spring on these recordings were drummer Pick Withers, who later became Dire Straits’ first drummer, guitarist Ray Martinez, who went on to become a respected session musician, and keyboard player Kips Brown. Pat Moran later became the house engineer at Rockfield Studios. By the time of the album recording sessions, Pat Moran had switched from drums to become the vocalist, and one of two additional Mellotron players assisting keyboard player Kips Brown. The band decided that as the Mellotron was such a beast to set up that they may as well make maximum use of the iconic instrument when playing live. As it had two keyboards, it was often played by two of the band at once. That and the fact that the main album was recorded virtually live with a few later overdubs gives Spring their distinctive sound. Well, we all know that “woe is me” navel-gazing has always been a trait of young males in whatever walk of life! No matter, the portentous combination of full-on Mellontronia and bleak lyrics is used to great effect throughout. That first lyric comes from Grail, probably my favourite track on the album. There is also a lightness of touch in the compositions that prevents the Mellotron overload from ever descending into the morass of bombast. Pat Moran has a highly distinctive and rather nasal voice that might take some getting used to, but I wouldn’t know as I’m more than used to it as I have lived with this record for well over 40 years…gulp! There are moments of relief from the pseudo-orchestral arrangements, and Boats, a wistful tale of leaving, is a short acoustic guitar-led ballad that wouldn’t sound out of place on a Lindisfarne album. Song To Absent Friends (The Island) is a quite lovely contemplative piano ballad in the manner of Clifford T. Ward, or a serious Gilbert O’Sullivan. Elsewhere, not all is Mellotron, as lead guitarist Ray Martinez gets to show his skills in a number of places, with a nice solo in Gazing for example, and the spidery and fuzzy lead line that lays out the top line melody on the militaristic marching intro section of Shipwrecked Soldier, a song that forgoes the personal for the allegorical lyric, and a decent tale it is too. The insistent rhythm is always there but ties in with the overall subtle feel of the song. “Pique” Withers, as he is called on the original album cover is a good drummer, as Mark Knopfler later noticed. Ray later contributes two blistering if rather short guitar solos to the mix, in call and response with Kips’ organ. This song is what Alan Freeman may well have deemed “progtastic”, if he ever played it, and he’d be right. The second disc contains the songs intended for the sadly never released second album, and it is an interesting exercise to compare its contents and running order to the long available Japanese bootleg edition, that if you’re a fan like me you’re sure to have! The first thing to say is that like the main album these tracks have been thoughtfully remastered by Ben Wiseman from the original tapes and they sound far better than the bootleg, as you would expect. The tracks are the same, but in a slightly different order, with titles from the unofficial release in brackets where appropriate. Less Mellotron drenched and with a harder edge, these later songs perhaps reflect the turning of the idealistic 1960s into the cynical 1970s. There are references to lost friends, presumably as a result of the drugs turning nastier too. The music is tougher but retains the Spring identity, with the pivotal song being Hendre Mews, here in two very different arrangements. The shorter version features flute and brass over a piano-led tune – real instruments, not the Mellotron – and morphs into a classical/jazz/honkytonk mash up, before returning to the flute section. Quite a lot is crammed into its four and a half minutes. The longer version is led by organ and chopping guitar chords, from a guest appearance Ray Martinez, who had left the band in disagreement at their jazzier direction, as the informative liner notes make known. Recalling John Du Cann’s Atomic Rooster, this is as heavy as Spring get, and it is ironic that Martinez took umbrage when this song on this second CD features him far more than previously. Another one where Ray shines with his skilled playing is World Full of Whispers, this time with some sterling acoustic guitar work. The songs on this “lost” album are shorter too, and their impact is more instant. The complexity of the arrangements has also been upped a notch or two, and it makes you wonder why they were dropped by their label, only to split up shortly after. Spring were one of many bands that under different circumstances might have made it. It was an era when every major label seemed to be signing any band that looked the part to their “underground” subsidiaries, only to spend sixpence on their promotion, if they were lucky. As a result, most releases had very short pressing runs; Spring for example had a pressing of only 2000, was barely noticed at the time and consequentially soon ended up in supermarket bargain bins, much to my delight. While it is true that a lot of those “one album” bands didn’t make it because they were actually not very good, this band are one of the few that should have been huge, but sank without trace. If you are a fan of early progressive rock, buy this excellent package, you won’t be disappointed. It is a cliché, but Spring really IS a “lost gem”.